K aokoland extends from the Kunene River southwards across a sparsely populated and harsh environment down to the Hoanib River. The area holds a special allure for lovers of remote and wild places to negotiate its challenging and rugged terrain in four-wheel-drive vehicles. In Kaokoland the desert-adapted-elephant home ranges cover as much as 3 000 km2, with the animals trekking up to 200 km in search of water. It was thought initially that these elephants were a different species to the African elephant, Loxodonta africana, because they had longer legs, were taller and had larger feet. However, because they have less to eat than their Etosha counterparts, they don’t carry the same body mass, and therefore appear to be taller and have longer legs. However, they do have larger feet, an environmental adaptation caused by their walking primarily on soft sand all their lives. By definition, desert-dwelling elephants occupy an arid habitat for at least part of the year and have special behavioural characteristics, large annual and seasonal ranges, and a social structure and daily activities suited to an arid environment. When feeding, these denizens of the desert take far greater care than their relatives in Etosha. They hardly ever fell trees, break fewer branches and debark much less than other elephants. Whereas adult elephants on average drink between 100–200 litres of water a day, in Kaokoland they drink only once every three or four days. 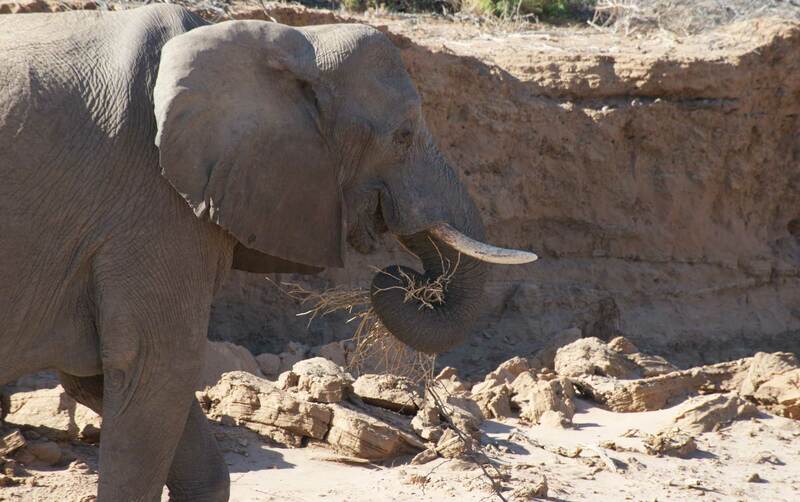 During droughts they dig deep, narrow holes (gorras) in dry riverbeds with their tusks, trunk and feet to find water. 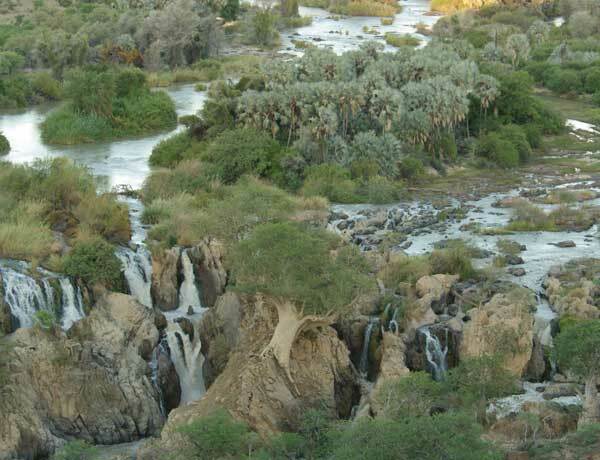 Enhanced by richly coloured rock walls, variety of trees including wild figs, baobabs and waving makalani palms, spectacular sunsets and perennially flowing waters, the Epupa area offers much to see, do and experience. Bird-watching is rewarding, especially for the rare rufous-tailed palm thrush. Also seen are bee-eaters, African fish-eagles, kingfishers ranging from the giant to the tiny malachite kingfisher, rosy-faced lovebirds, paradise flycatchers, louries, bulbuls, hornbills and rollers. Scattered settlements of Himba are an especially interesting feature of the area. Although officially declared as a town only at the end of 2000, Opuwo has long acted as the capital of the Kunene Region, and as the gateway to Epupa Falls and the land of the Himba people. The town itself doesn’t offer much for the tourist, except in the form of hand-made made jewellery and other crafts, which can be found on the streets and at the open market. The Kunene Craft Centre is also a good place to stock up on souvenirs from the area. Opuwo has well-stocked grocery shops, Internet Cafes, a post office, banks, fuel, a hospital, and everything else a traveller might need. A good place to eat is the Kaokoland Restaurant, located in the Opuwo Business Park. Opuwo is connected to Kamanjab and Windhoek by a tarred road that is in excellent condition. There’s an airfield in town, managed by the Opuwo Country Hotel. At 120 metres high and 700 metres wide, the Ruacana Falls on the Kunene River is one of the largest waterfalls in Africa. However, for most of the year the waterfall is dry, due to the Ruacana Hydropower Plant upstream, which meets more than 50% of Namibia’s electricity requirements. Amidst spectacular scenery and splendid solitude, the Okarohombo Community Campsite on the banks of the Kunene River offers four separate campsites under giant ana trees. A very exclusive camping spot is Enyandi Camp, located at the junction of the Enyandi and Kunene rivers. 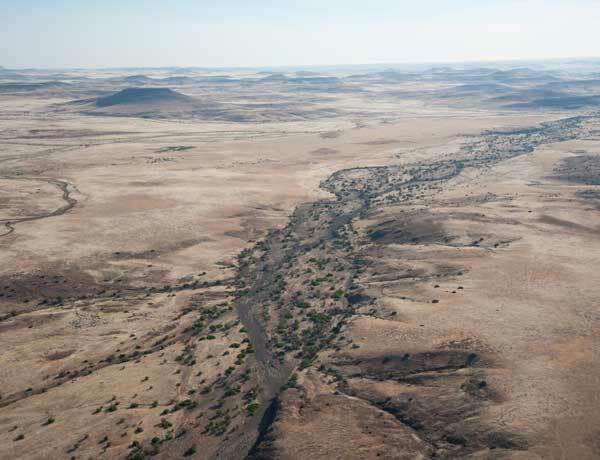 The camp is accessed from the road between Swartbooisdrift and the Epupa Falls, and only seasoned 4×4 drivers in well-equipped vehicles should attempt to drive there. Enyandi has no organised campsite, but the large fig tree on the banks of the river invites you to camp under its spreading branches. As far as amenities go, there is no water other than from the river. The camp is managed by the Kunene Conservancy. The Hippo Pools Campsite, accessible from the C46 road leading from Oshakati, is located 37 km west of Ruacana, within the sound of the Ruacana Falls in the Kunene River. It has well-appointed ablution blocks, and each campsite has its own braai facilities. Guided walks are offered to view the falls and the NamPower hydroelectric power station.